The area on the south side of Marina Bay can easily be summed up as being Raffles Place Station and the Marina Bay Sands complex. It is a vast area that is still being developed and will continue to change over the next few years. 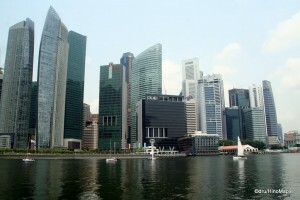 It is a place where seeing the old traditional look of Singapore is being squeezed out by the new modern complexes. Most businessmen will be heading to this area more often while most tourists will just pass that area and head straight to the shopping complex and casino in the Marina Bay Sands Hotel. It may not be as varied as the Bugis and City Hall area but it is just as important. Raffles Place Station feels like a misnomer to me. It is a name of the station in the central business district of Singapore but the Raffles Hotel is not located near this station. Most of this area is generally pretty boring. You can head into the core business district and see many tall and architecturally interesting buildings. It is a beacon of modern architecture, but that is about it. Unless you are interested in taking photographs of these buildings and some of the art that is spread throughout the area, it won’t be interesting. In fact, on the weekends, even Saturdays, the entire area is nearly shut down. There is very little to do as many of the shops were closed, including the shopping malls during the F1 weekend! The river and bay side is where most tourists will flock. There is a bridge connecting the Parliament Building to the south side of the river. Along the river, Boat Quay, there are dozens of small restaurants and bars. It is a great place to get a meal, but be aware that the people there are very aggressive, especially around lunch time. It was difficult for me to just walk around without someone trying to coax me to eat at their restaurant. I couldn’t relax as much as I wanted and make my own choice, but the same time it is a great way to get information on the restaurants. I learned that most of the restaurants had a happy hour in the afternoon. In fact, most of Singapore has happy hour specials that last from noon-5pm. Liquor is usually half priced, around $5 a glass. From 5-8pm, it is usually 25% off and from 8pm, regularly priced. The shops on the river are actually wonderful once you sit down. The prices are reasonable for lunch and they offer outdoor terraces with riverfront views. 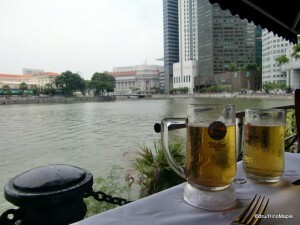 I enjoyed a nice Indian lunch while having wonderful views of an art gallery and the Fullerton Hotel. Most of the restaurants and bars are almost exactly the same, aside from the food they serve, and they do have indoor areas that are air conditioned, but on a beautiful day, I couldn’t resist the riverfront view. Marina Bay can easily be summed up as the area around the Marina Bay Sands. The Marina Bay Sands is a huge hotel complex that includes a museum, future convention centre, future botanical garden, hotel, casino, and shopping mall. It is a place of luxury for one of the most highly recommended hotels in the world. The main sight for a tourist has to be the observation deck at the top of the hotel. It is a little expensive but the top of the hotel has a large floor that is shaped like a boat. Unless you are a guest of the hotel, you are limited to the bow of the ship which provides views of Marina Bay, the most important area. The observation deck is a little sparse with just an open deck area. There is a restaurant/bar at the top as well but from what I was told it is a little expensive. You can enjoy a nice lunch there but that’s about it. Unfortunately, you cannot go to the pool area or enter the pool. It is limited to hotel guests only. Thankfully you can see the pool from the observation deck but you cannot get close to it. The casino in the hotel is nice but very boring. I found the casino to be very typical. Bags are not allowed and you must show your passport or you’ll have to pay a high fee to enter. While I’m not a real gambler, I wanted to try it out again but my experience was not good this time. You definitely need to go with good friends and have a fun time with it. I found the rules of the casino to be a bit strange compared to my trip to Las Vegas. Las Vegas knows how to gamble and I’ll leave it at that. The mall itself was good. There are lots of high end shops and many things to see. Unfortunately, if you don’t have the wallet to make purchases there, you won’t be able to do too much. There is an indoor “ice” rink that is made out of some sort of plastic. It wasn’t very popular but a few children did have a great time on the “ice”. Other than that, the entire area is not very interesting. The outdoor boardwalk was more interesting. 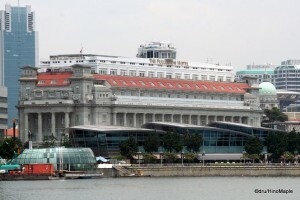 The last area of interest is the Fullerton Hotel area. 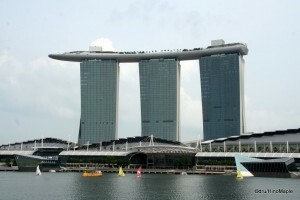 It is nestled across the bay from the Marina Bay Sands and connected to the riverfront. 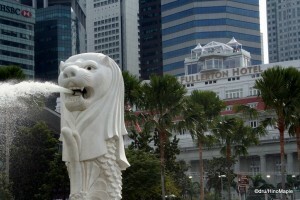 The Fullerton Hotel itself is a typical old high end looking hotel, but on the other side of the hotel is Merlion Park which has the famous Merlion. The Merlion is a famous tourist spot that has the mythological lion-mermaid. Positioned at the edge where a Marina meets the Singapore River, the Merlion continuously spews high pressure water out of its mouth providing cute pictures. Having lived in Japan for a while, it is somewhat customary for people to open their mouths and take a picture as if they are drinking from the lion’s… spit… Of course I did that and had a fun time playing around the Merlion itself. Behind the Merlion is a mini-Merlion. This one is less than 2 metres tall and made of tile. It is a very anti-climactic model from the original. In fact, the original Merlion is not very interesting, to be very honest. I would rate the mini-Merlion as very disappointing but a good novelty. There are other restaurants and cafes around the area as well as a connecting bridge to the north side of the bay itself. While I’ll probably never return to this specific area, I do recommend it to those who visit the area for the first time. The Raffles Place and Marina Bay areas are an essential area to visit for tourists, although I personally didn’t find it to be that interesting. It has a lot to see and do and there are great things about the area. I still prefer the old side of Singapore compared to the modern areas. I can generally see architecturally interesting buildings in Tokyo relatively easily so seeing new modern buildings is not always interesting for me. For others, it can be a very fun place to be. For those who are visiting Singapore for business, it is probably necessary to visit this area and heading to the riverfront after work is a good idea. You can relax a lot and enjoy the beautiful views. It’s not the best but it is still a good place to be. This entry was posted in East Asia and tagged Boat Quay, casino, Customs House, Fullerton Hotel, Marina Bay, Marina Bay Sands, Marina Bay Sands Hotel, Marina Bay Station, Merlion, Merlion Park, mini-merlion, Raffles Place, Raffles Place Station, Singapore by Dru. Bookmark the permalink.